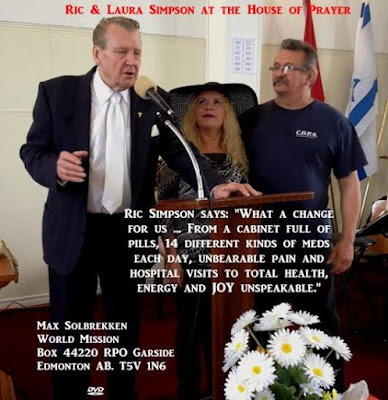 Solbrekken's interview with Laura Simpson whom our Lord Jesus Christ healed miraculously on Mother's Day 2014. I Desperately Needed a Miracle. 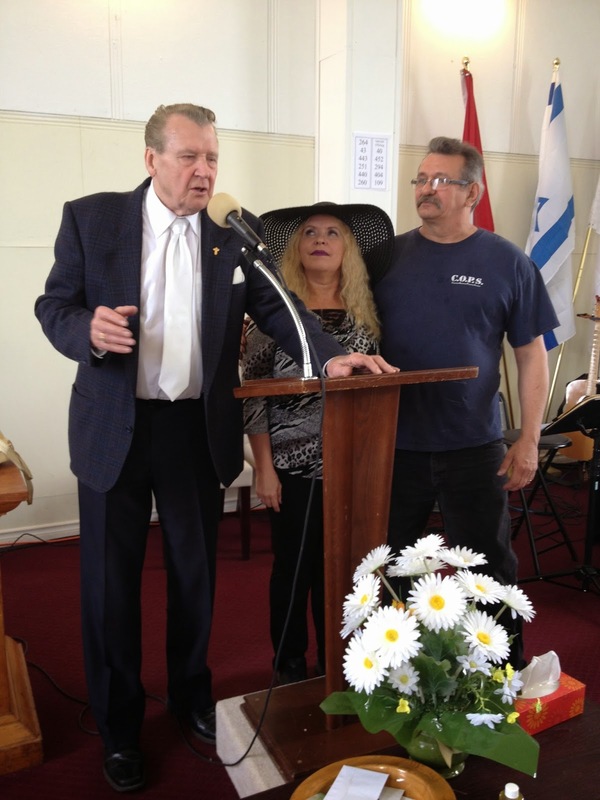 Pastor Max Solbrekken prayed for me. The Pain Stopped, my Body Shook into Normal and I was Healed! October 23/1991 I was driving my children to school. I had just dropped my two younger daughters off at their school and was heading down Yale Rd in Chilliwack BC. We had just moved to BC 6 weeks earlier from Winnipeg MB. And I was looking forward to my new PT job at Costco in Surrey BC. As I stopped just past the light on Yale and Hocking to drop my oldest daughter off at her school I saw bright lights coming at me from the rear view mirror. Tara was struggling with her seat belt so I reached over to release it for her, as the Monster truck on huge tires was coming up behind me faster than it should have. I pushed Tara out of the car saying, "Hurry, there's a truck behind me." The light was red so he should have stopped giving me time to get going but he slammed into my rear end, then proceeded to crunch over my Chevette like an accordion as I was pushing Tara out. She did not even have time to close her door before impact. So I had no time to accelerate to get out of its way. Within seconds I was pinned in my car being thrown in every direction. Tara stood there in horror as the truck crushed my car pinning me inside. Two guys from the Super Save gas station across the street ran to my aid and detained the guy who hit me, from leaving the scene of the accident. They rushed me to Chilliwack hospital 6 blocks away. The Doctors were checking me over. Examining my body. But I don't remember any of what they said or did at that time. Except that I had massive soft muscle damage. And a possible closed head injury. My next memory was of extreme pain. I could not walk more than 2-3 feet without collapsing on the floor. For the next 2 years I was completely bed ridden, getting up only to try to reach the bathroom and back. Home support workers tended to me and my children during this time, as my husband had walked out on us. Slowly I began trying to walk a few more feet at a time. My hip would snap out of place after a few steps and I could not walk any farther but daily I tried to make it a couple steps more. Doctor's visits were painful as the Doctor poked and prodded me all over checking for any improvements. He finally decided I needed to start physio therapy (2 years post MVA) so he booked me an appt at Sardis Physio clinic. After a long time of therapy (about a year and a half) and I was not healing. So they said I needed an MRI done to see why my body was not healing properly. They found I had 4 ruptured discs from L3-s1. With a crack on L5. So they had to go about changing the way they were doing things. They sent me to the Thorson Pain Clinic in Lynn Valley. Over the next several years I saw many specialists and therapists. My neurologist also sent me to another Dr. who diagnosed me With Fibromyalgia. As if I didn't have enough on my plate. Over time I was learning to walk again and to talk without a constant stutter. My body was in constant pain my personality did a 180 it changed from an extrovert to a total introvert. I rarely left the house and life was no longer fun at our house for my children as my injuries took away from doing anything that was fun together. My body was just not healing. I had such a hard time dealing with my pain and they were having to change and adjust my medicines so often. Over time I became allergic to some of the meds. At one point I was on 14 different meds from 1 to 6 pills per day. I could not even think about my life before, working was totally out of the picture let alone planning any activities with my children. For many years I wanted to end my life, but my Father-in-law had done that and I knew I could not do that to my children. Their lives would be even more devastated than the trauma of what we were going through already, but the devil kept trying to persuade me that my children would be better off if I could find them a good Dad so I could check out of life. Five years post- accident, I was still a mess. But now other's lives were affected too as I tried to find someone to love my kids so I could end my life. At times I would pray to die because the pain was so bad. But eventually I began to learn to deal with my life as it was. I was on pain meds every day to help me get out of bed, to make it through the day, and to help me sleep at night. Even sitting in one place and standing was so hard on my spine I had to rock or sway just to manage the pain. I was struggling to manage our daily lives. One day my youngest daughter Crystal told me she was pregnant. She was only 15 and needed my advice. I told her that if she wanted to keep it or give it up for adoption I would stand by her either way. She chose to keep him. I named him Michael. I knew I needed to get more strength to help her raise this child I prayed that God would help us. I wanted so badly to live now to help raise this child up to live for Jesus. I was still struggling with so much pain but I had so much reason to try that much harder to overcome what our lives had become since the MVA. I daily prayed for God to heal my body but every day I woke up with very little if any improvements. As my children grew up and I was on my own I moved into Lynn Haven Society. It was home for elderly people and people with disabilities. I was 50 years old by this time. The Doctors said I would just have to accept that I will have pain for the rest of my life and that I had developed scoliosis from the MVA as well. The man I was married to had passed away and I felt like I really needed to make more changes in my life. I concentrated on getting closer to God. Then God brought Ric into my life and I began to manage my life better. Being truly loved helped me to heal a bit better. But I longed for a pain free life. 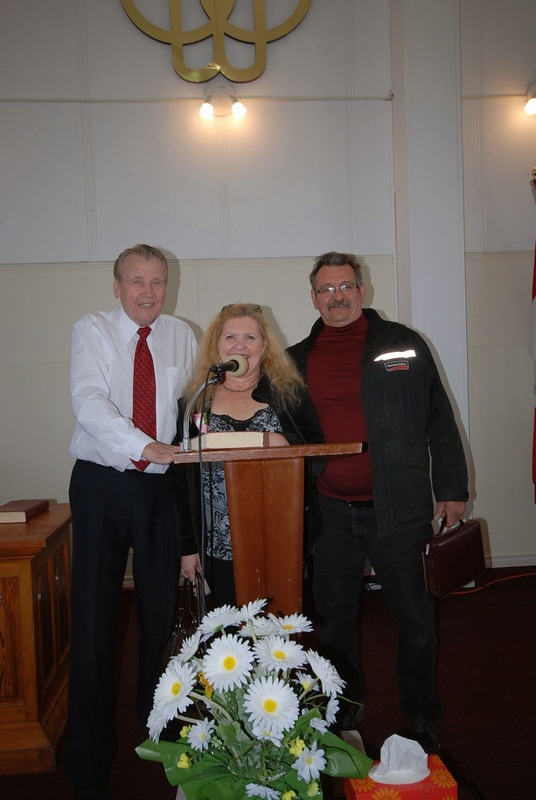 We moved from Abbotsford BC to Terrace BC to Alberta where we bought a house in New Sarepta. I began going to the House of Prayer where Max Solbrekken was the pastor. On Mother's Day 2014 I went up for prayer with my friend Diane (who was injured in an MVA 2years ago) I did not want her to suffer as I have been suffering so I suggested we go up together so Max could pray for her. He prayed for her and then he put his hands on me to pray for my healing. Our husbands came up behind us to pray with us and as Max was holding my head on both sides with his hands. I felt a power go through my body. It started moving to my knees then back upward to my hips and spine pushing in places and pulling in other places pushing up my rib cage and straightening my body all the while on the outward you could see anything happening as God's Holy Spirit rocked through my body. When Pastor Max had finished praying. I thought: "Wow what just happened to me?" Every part of my body felt something go through it." I returned to my seat. My spine felt better. I was experiencing what it finally felt to feel no pain.! I lifted my shirt at the back and got Ric (my Husband) to look at it. Then I asked Diane to check it too as they both saw how deeply indented my spine was before and both agreed that it looked better. I was so excited I walked up to the front of the church to tell Pastor Max what God had done for me. It has been 4 days since God healed my body. Four days of not one pill entering my body. Four days of 'Praising the Lord' that I am not in pain and not on medicine to numb me. The pain before was so bad at times that even though we have only moved to Alberta in the past 3-4 months I have ended up in the hospital 2 times. And they had progressed my meds to Demerol for the past 2 years. But now I can dispose of it knowing I am finally healed God is so Good. I want the world to know that He loves them and wants to heal you too! P.S. Surgeons had told me that any surgery on my spine would be so risky that they had to wait until the pains were so severe that I was sitting in a wheel chair, before they attempt the surgery! L.S.